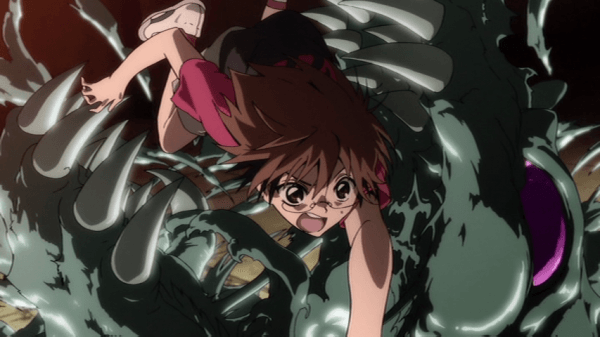 While some shōnen anime can air week after week without break, often suffering from filler episodes, other series are usually given one or two thirteen episode seasons to tell a story. 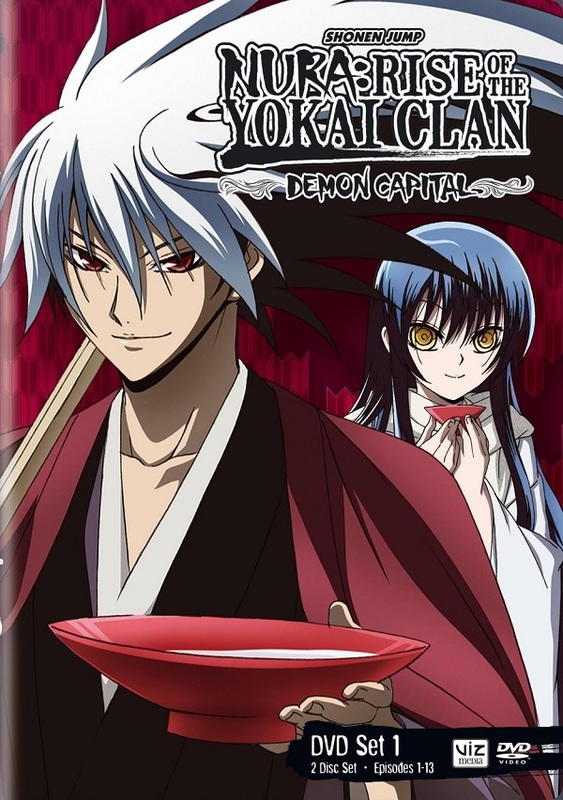 Then there are series such as Nura: Rise of the Yokai Clan which has already been given a twenty six episode season which now continues with Nura: Rise of the Yokai Clan – Demon Capital. While the first season may have been lacking in a number of areas, will the start of Demon Capital pick up the pace? 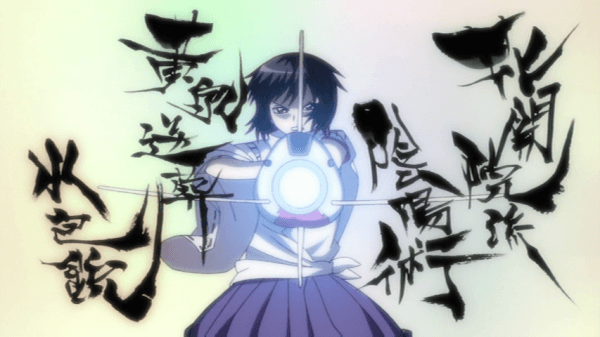 For those unfamiliar with the first season, Nura: Rise of the Yōkai Clan follows the story of Rikuo Nura, a teenage boy who attends classes at school and lives a relatively normal, albeit somewhat sheltered, life. At least that is what his classmates are led to believe, as Rikuo is actually part yōkai, though only a quarter of his blood is yōkai while the other three quarters are human. 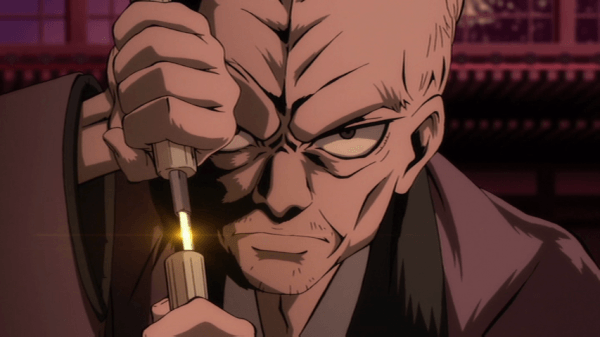 He lives in a house full of yōkai from the Nura Clan, a once powerful yakuza style group of yōkai and is protected by a number of close yōkai friends and his grandfather, Nurarihyon the Supreme Commander of the clan. Thanks to his yōkai blood he can transform into his yōkai form at night and after successfully managing to eliminate a powerful threat against the Nura Clan, Rikuou, who previously did not wish to become the Third Heir to the Nura Clan, begins to accept his role. Now the start of Nura: Rise of the Yokai Clan – Demon Capital actually begins with a flashback to when Rikuo was a young child and his father was still alive. During this flashback Rikuo remembers seeing the person who killed his father, a mysterious young girl with black hair. Back in the present, two men arrive in town and after clashing against members of the Nura Clan, are revealed to be onmyoji, both of which have close ties to Rikuo’s friend Yura. After battling against both Yura and Rikuo after revealing his secret, these two men inform Yura that a powerful yōkai by the name of Hagoromo Gitsune and her clan have been destroying seals in Kyoto in order to bring about a dark force. 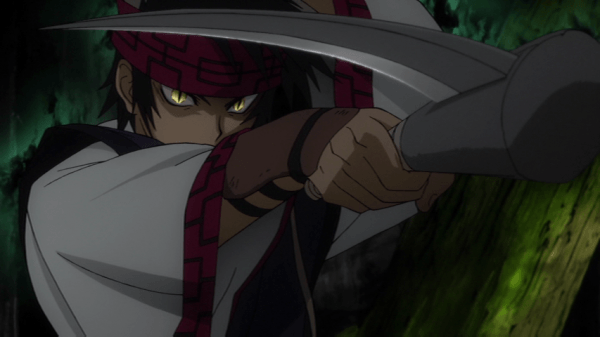 Following a flashback explaining the relation between Gitsune and the members of the Nura Clan, Rikuo is determined to put a stop to Gitsune as well as protect Yura and, after some preparation, sets off to Kyoto with both old and new allies. Now if it sounds like the description of the story there is a bit erratic, it is likely due to the fact that I do not wish to spoil too much of the story as Nura: Rise of the Yokai Clan – Demon Capital Set 1 constantly moves at a steady pace with little downtime. While flashbacks can be seen as crutches and padding, they are used wisely in this set as not only are we able to see how Rikuo was as a child, but also the face of his father’s killer. Not only that, but the multi-episode flashback explaining what happened four hundred years ago in Kyoto provides viewers with extra details about Rikuo’s new foes as well as meaningful backstory. Another crutch that this set avoids is the training arc. 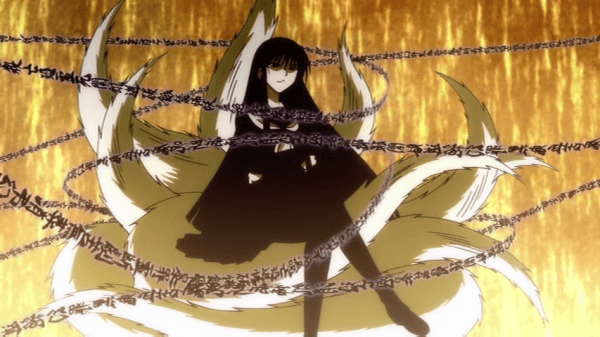 Since Gitsune and her minions are terrifying opponents to face off against, Rikuo is sent to train in the excluded village of Tono to master his yōkai abilities. In this segment viewers are introduced to a number of new yōkai, many of which stick around, as well as a few action segments which take up much of this set. Whenever the story isn’t being advanced there is usually someone fighting against someone else as battles are abundant in this set, with onmyoji battling yōkai, yōkai fighting yōkai, and more. These action segments are nicely handled and it is good to see Rikuo actually entering the fray himself now that he has learned new techniques. Nura: Rise of the Yokai Clan – Demon Capital Set 1 manages to constantly keep things moving at a brisk pace while expanding upon the story of the Nura Clan and rarely shifting the focus elsewhere, though there are a few slow moments that focus on the Paranormal Patrol. It is also worth noting that although this set contains the first thirteen episodes, the thirteenth episode is a recap of everything that has happened over the first twelve episodes of the set. The artwork and animation for Nura: Rise of the Yokai Clan remain strong and interesting in this release, thanks in part to the unique appearances of many of the yōkai that appear in the show. The characters are nicely detailed with interesting designs and the backgrounds are fairly varied, though it is worth noting that most of the action takes place at night due to Rikuo’s limitations. As for the battles, the animation remains fluid and impressive looking with no noticeable drops in quality. These battles are a real highlight for the series, as they often revolve more around trickery and special abilities than simply using brute force, though when brute force is necessary it is just as nicely handled as the battles of wits. With Nura: Rise of the Yokai Clan – Demon Capital Set 1, Viz Media has retained the voice actors and actresses that performed characters in the first season. The English voice cast continues to handle their characters nicely, especially with the voice change between Rikuo’s yōkai and human form, and the new characters that are introduced in this set are also handled well. That being said, the Japanese voice track is also available for anime fans that prefer that option. The background music for the series has a nice Japanese style theme to it which is fitting for the series and works well, though most of the tracks are still fairly forgettable. As for the opening theme, we have “Hoshi no Arika” by LM.C which is a fitting theme that works well for the series, and “Orange Smile” by Katate Size as the ending theme, which is a change of pace featuring bubbly sounding music focusing on the three main girls of the series. As far as bonus features go, we have some of the standard offerings for a Viz release. There are ten pieces of production art from the show, all of which are black and white sketches of characters and yōkai, only the clean opening with no clean ending theme which is odd, an omake, and trailers for other Viz anime series. As for the omake, it is a three and a half minute collection of English dubbed shorts. These shorts are roughly thirty seconds in length and are all fairly humorous and mostly focus on the female members of the Paranormal Patrol, though one does focus on the Tengu members of the Nura Clan. 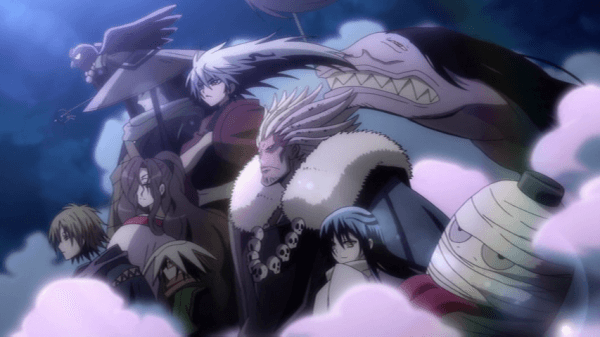 Nura: Rise of the Yokai Clan – Demon Capital Set 1 starts out strong and manages to keep up the pace throughout the release, barring the final recap episode of course. 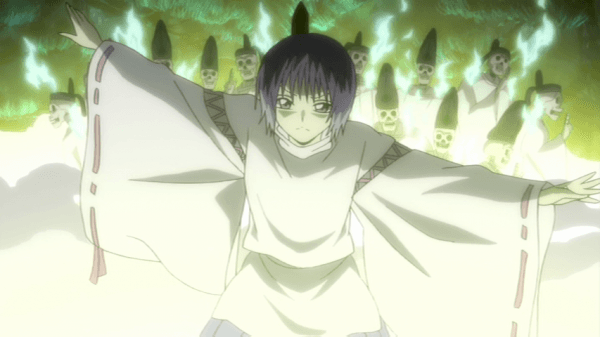 With Rikou and the majority of the Nura Clan, as well as some new allies from Tona Village, venturing into Kyoto to face off against a new foe, viewers are in for a treat as this set not only provides viewers plenty of backstory and build-up for the upcoming action, but also features plenty of action and a plot that surpasses that of the first season.